Oyay! Oyay, ye Rolling Stones! Who would have guessed that in 1965, the most accurate prognosticators of the twenty-first century would have been the Rolling Stones? I mean, give me a break! Computer technology—which was quite limited in 1965—has today become so cloud dependent—forty-plus years after their warning. More importantly, today there are hackers at every turn . . . . It’s almost eerie. How did Keith Richards and Mick Jagger know what was coming? They are the two most unlikely people . . . 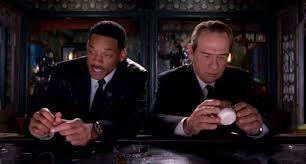 Unless you’re a fan of Men in Black, in which case, that explains a lot. On the other hand, Will Smith and Tommy Lee Jones–as much as I love their acting–have always struck me as just a bit different.